Coalitions have been used successfully in the United States to tackle a number of seemingly intractable problems. For communities that want to reduce their underage drinking problem, putting together a broad-based coalition can bring substantial dividends. 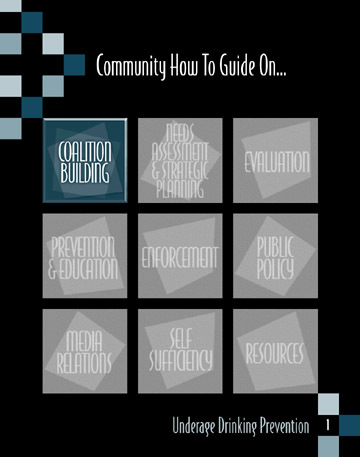 In this Community How To Guide on Coalition Building, readers will learn the steps that bring together a diverse group of people in pursuit of a common goal. Effective coalitions, however, require an effective leader and this booklet details what will be needed from the individual who coordinates the effort either as a full- or part-time staff person. Once that individual has been identified, the group can move forward in recruiting the appropriate members of the community. A coalition checklist is included in the Appendix that provides a list of every conceivable organization that may have an interest or stake in the underage drinking issue. To make the process easier, the checklist asks individuals to rate the importance or each group as well as the likelihood of the groups involvement. Establishing a coalition can sometimes be easier than maintaining it. To assist communities in sustaining their underage drinking prevention coalition or organization, this booklet discusses ways to overcome obstacles and gives specific ideas on how to keep the effort going. In addition, the reader will learn how coalitions can support critical programs in the community including enforcement and education, thereby making the effort even more relevant to the key target groups. Finally, the booklet details ways to market the coalition and provides concrete examples of how the coalition can communicate with the public and its members. Samples are provided for an organizational brochure and a newsletter. A coalition is an alliance of individuals, groups, parties, or states that come together, join forces, or form partnerships usually for a specific or common purpose. Bringing people together in pursuit of a common goal is how a comprehensive underage drinking prevention program starts. Forming a coalition to deal with the problem of underage drinking is neither a new nor radical idea. The traffic safety community has been using coalitions to deal with the problems of impaired driving and occupant protection for decades. Mothers Against Drunk Driving (MADD) is a good example of an effective coalition. MADD began with one enraged mother and expanded to become a group of ordinary people who helped change the way society views drunk driving. Before that time, many people did not think seriously about having one for the road. It was a badge of honor to see how many drinks a person could consume and still drive. 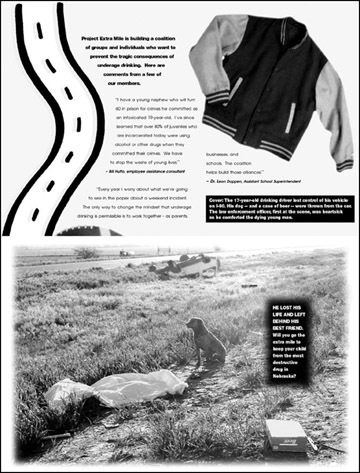 That is not the case today and citizen activist groups like MADD, RID (Remove Intoxicated Drivers) and SADD (Students Against Destructive Decisions) helped to make the difference. Impaired driving is now recognized as a crime and that is due to the coalitions who worked to change public perception, strengthen laws and increase enforcement. Today, coalition organizers must think creatively when they organize an underage drinking prevention coalition. A broad-based coalition includes more than the traditional organizations that have a professional or personal interest in the issue such as youth, law enforcement, judges, prosecutors, educators and citizen activist groups. Many other agencies, individuals and organizations also have a stake in underage drinking prevention and organizers should expand the circle of friends. Effective coalitions include members from the faith community, the military, civic groups, the YMCA, media outlets, Emergency Medical Services personnel, hospitals, physicians, trauma units, health insurance companies, treatment centers, neighborhood groups, an industry wellness council, the United Way and others. A broad-based, grassroots coalition enhances credibility. One saying is especially appropriate for coalitions: It is easy to cut one blade of grass, but if you bind many blades together into a sheaf, they are very difficult to cut through. The more widespread support a project can demonstrate, the more seriously the effort is perceived. When the project demonstrates both widespread support and active involvement, opinion leaders, the media and the public begin to take the effort seriously and pay attention. Diverse participants provide diverse skills as well as access to important target populations, i.e., youth, the media, business, policymakers and others. Each coalition member or member organization can contribute their particular expertise or resources to facilitate activities by other members or by the coalition as a whole. They can help organize alcohol-free activities for youth, assist with training, recruit new members or volunteers, hand out flyers, or conduct a market survey. By working together, members often find they solve mutual problems. A representative from a local parent organization, for instance, may be able to provide parent support to plan, organize and implement an alcohol- and drug-free after prom or graduation party. By pooling resources, coalition members multiply opportunities. Many groups or individuals get involved in coalitions because they want to meet other professionals for business or personal reasons. By their very nature, coalitions offer great networking opportunities. Effective networking also means coalition members can identify organizations that can fill a specific need, answer a question, facilitate an introduction or help to secure funds. Any program can get stale and die out if it isnt re-energized with new people and new energy. A fresh perspective on the projects issue may be just what it is needed to get things moving again. Substance abuse prevention organizations, for instance, may require the shot in the arm that a broad-based program to prevent underage drinking can provide. If a community wants to change behavior or attitudes, it is important to know what is going on in that community. One person, or even a small staff, cannot know everything that is relevant to their issue, including information about related programs and potential funding. A grassroots coalition can be the eyes and ears and provide important intelligence information. A wise coalition coordinator will solicit and coalesce the information available from individual members. One good use of this information and feedback is in the completion of a thorough needs assessment on the nature and extent of underage drinking in the community. (See Community How To Guide on Needs Assessments and Strategic Planning.) Members of the coalition from traffic safety, law enforcement, the medical community, the schools and local government can each provide information about their area of expertise and make it faster and easier to complete this vital task. A coalitions members should be ambassadors for the program, thus broadening the reach of its message and increasing the projects exposure. This is particularly important for a community-wide problem such as underage drinking. A coalition may want to provide a sample article to coalition members whose organizations have a newsletter or other publication and request that they publish it. One of the challenges in implementing public information and education campaigns is distributing materials in the community. Most groups lack resources and staff to disseminate large amounts of information. Materials may be beautifully produced, but if they are unseen, they are valueless. Through their jobs and neighborhood connections, coalition members can serve as an effective network for dissemination. Employers can establish and implement company policies in support of a program. As a viable part of the community, employers can participate in community outreach efforts. Public health departments and clinics have access to various target populations such as immunizations clinics, which can be linked to an underage drinking prevention effort. They also have data. Large employers such as hospitals, manufacturers, and retail chains can distribute information such as paycheck stuffers, hold brownbag lunches, display posters at the job site and include materials in wellness programs. Civic associations, service clubs (Rotary, Kiwanis, Junior League, etc. ), and chambers of commerce can be extremely helpful to a coalition. They can spread information in their newsletters, and provide the coalition with an opportunity to share their message with members. Forming a coalition sounds easy, but proper planning and knowledge can avoid problems in the future. Following are some suggested steps to follow in putting together a coalition. Should your coalition become part of an existing coalition? What are the advantages and disadvantages of becoming part of an existing group? Should the coalition operate separately and coordinate information, programs and activities with existing organizations? Ask three or four other individuals who are affiliated with the current organization or who are well connected in the community to participate in a brainstorming session. Consider inviting representatives from the target population to also participate. This session is designed to solicit names of individuals to contact. Who are the communitys key leaders? Who are the obvious stakeholders in the issue? Whose participation will be critical to the success of the effort? Are diverse populations of the community represented? Sometimes coalitions can attain visibility and recruit members more quickly if they have a powerful champion. The champion may be a judge, political leader, business person, civic leader or member of the faith community, but they should be someone who is well respected and able to generate support for the new entity. Appendix #1 is a Coalition Membership Checklist, which gives a list of the various organizations that could belong to a broad-based underage drinking prevention coalition. Use this checklist when brainstorming on potential members. It may also be used to assess the effectiveness of an existing underage drinking prevention project. The person who manages the coalition is critically important. Coalitions without a staff person dedicated to managing their programs often fail. Whether it is a newly formed group or an existing organization taking on a new mission, coalitions need to be administered, programs need to be carefully implemented and coalition members need to be inspired to continue their work. Each coalition must determine how those tasks will be handled. Following are a list of questions that a coalition should answer with respect to staffing needs. Will the project director or other manager be paid? Where will those funds come from and how much money will be needed? How much time will the project coordinator be required to dedicate to the program? Will that person have other responsibilities? Who will supervise the coordinator? Another coalition resource question involves housing the entity. Is there sufficient funding to rent office space or will the coalition be housed at a coalition members office location? Is there an organization in the community willing to donate office space as an inkind contribution to the effort? Coalitions with more than ten members also may need to locate additional space for meetings. Often small organizations lack adequate facilities for large groups. A coalition member may, however, have board or meeting rooms they would be willing to let the coalition use each month as part of their contribution (in fact, for some members, like a hotel or conference center that may be a major part of their participation). In some cases, coalition members may choose to rotate the responsibility for hosting the meeting at their offices, but in that case, the coordinator must be especially careful to make sure that members know the schedule and know how to get to the site of each meeting. Finally, there are costs associated with forming and maintaining the coalition. Expenses include furniture and equipment, postage to mail information, printing and copying and even refreshments for each meeting. Insure that adequate funding or inkind support is available to cover these costs. Also, if the coalition receives government funding, there may be restrictions on the purchase of equipment, furniture or refreshments. If the government grant does not permit the coalition to spend their funds on these items, funding must be obtained elsewhere. Draft a letter of invitation asking potential members to attend an organizing meeting. If you have recruited a champion, ask him or her to sign the letter. An elected official, a judge, the head of a government agency, the police chief, a prominent business person or some other prominent individual or group of individuals would be good choices. A personal invitation may be more beneficial for some of the more prominent individuals, rather than a letter. Assess whats in it for them and use this in your recruitment message. Develop a list of roles and responsibilities for coalition members. Include the number of times the group can expect to meet throughout the year, the time of the meetings, what is expected of the group, and what individuals may be expected to contribute. Decide what policies or criteria exist for membership. Make a follow-up phone call two days prior to the meeting to remind individuals to attend. Include some basic activities in the list of roles and responsibilities. For instance, the first activity might be to conduct a needs assessment and individuals may be asked to distribute a market survey to people in their neighborhoods or their organization. Appendix #2 is a sample list of Roles and Responsibilities. As underage drinking prevention programs expand and reach out to new partners, they will be contacting people unfamiliar with their issues. The task of the coordinators is to demonstrate how the potential members priorities and tasks intersect with those of the coalition. They must see whats in it for them and how they can contribute to the coalition. To avoid confusion follow these simple rules. Dont use acronyms or jargon. Every profession has its own language. For instance, explain what NHTSA (National Highway Traffic Safety Administration) stands for and how the agency is relevant to the work the project is conducting. What is the mission and goals of their organization? How their organization is funded? Who has the final say on policies and programs? The type(s) of services or product(s) do they provide? How their work can contribute to the overall mission of the coalition? What they hope to gain from their participation? Request that each member bring a sufficient number of materials/brochures about their organization to distribute to the entire coalition. Require every coalition member to participate in the show and tell exercise, even when what their organizations do is obvious, such as the police department. The individuals representing a police department may wish to talk about the activities of their particular unit, for instance, or an underage drinking enforcement initiative they are implementing. Honor each participants views and reasons for participating. A diverse group of people often results in a diverse set of expectations and goals. The purpose of a broad-based coalition is to reach agreement on the mission, goals and objectives. If there is an area of disagreement, where compromise is not possible, agree to disagree and move on. A mission statement expresses the shared vision of a diverse group of people seeking a common goal. The Community How To Guide on Needs Assessment and Strategic Planning provides strategies for crafting a strong mission statement and provides an example of a mission statement for an underage drinking prevention coalition. Once a coalition has determined its purpose through a mission statement, the next important task is to define goals and objectives. The Community How To Guide on Needs Assessment and Strategic Planning includes information on how coalitions can use information gained through a comprehensive needs assessment process to develop goals and objectives that are targeted directly at the problem. The most important element in any coalition is the coordinator. The absence of a coordinator or a coordinator that does not have sufficient time or interest can make or break the work of a coalition. The coordinator is the individual, who starts the ball rolling, organizes the coalition, provides the essential structure and leads the organizations efforts. Good, energetic and strong coordinators result in good, energetic and successful coalitions. Full-time, paid coordinators are recommended as the best option but part-time coordinators can be used as long as there is a clear understanding of the workload and a strong commitment from the person to do the work. The importance of a coordinator cannot be stressed enough because too often it is the lack of this essential element that dooms a good idea. It also makes it more difficult in the future if the problem of underage drinking continues, but people perceive efforts to tackle the problem as a failure -- all because there was no one to lead and organize the effort. Respected by others, generate confidence and know how to cooperate. Able to inspire others and motivate them to take action. Knowledgeable about their organiza tion/group and the issue(s) the group supports, and is enthusiastic about achieving goals. Have the capacity to see diversity in all its forms and the skills needed for conflict resolution and consensus building. Able to build ownership and commitment among others. Able to take initiative and demonstrate drive when necessary. Appendix #3 is a Checklist of Attributes of a Good Coordinator. One of the easiest ways to attract people to join a coalition is to involve a prominent member of the community who commands respect and admiration from others. Within every community there are movers and shakers; people who are recognized, respected and who get things done. With any luck, a coalition will include several members who are movers and shakers. Marty Conboy, the city prosecutor in Omaha, Nebraska, is a good example of a mover and shaker. As the prosecutor, Mr. Conboy commands respect and attention from both the public and private sectors. Even given his extremely busy schedule, he was willing to chair Project Extra Miles committee on advocacy issues. His prestige and knowledge of the community and the law has been invaluable to the work of the coalition. Involve people whose jobs relate to the work of the coalition such as police officers, EMS personnel, educators, and substance abuse prevention and treatment specialists. Reach out to non-traditional partners in the community such as hospitals, doctors, service clubs, the media, the military and the faith community. Non-traditional partners can help gather important information about the nature and consequences of underage drinking in the community. They can also make the issue come alive for the public and policymakers by relating their own experiences. When doctors, nurses or emergency personnel talk about the tragedies associated with underage drinking, they help others in the community -- including policymakers -- understand the real consequences of youthful drinking. Identify people who may have a personal interest in underage drinking as well as people who have a professional interest. Victims of an impaired driving crash or young people who have experienced problems with alcohol bring a realistic view to the work of the coalition. These potential members may be harder to identify than job-related participants, but their individual commitment can be invaluable and they can work well with the professionals. Keep the size of the coalition and number of participants to a manageable level. Although a coalition should be as broad-based and inclusive as possible, the size of the coalition must be manageable in order for anything to be accomplished. Appropriate size is a key consideration. It cannot be too small, because everyone cannot attend every meeting, and there must be enough people at each meeting to make decisions. A good gauge is between 15 to 25 members, depending upon the individual community. Develop a coalition structure that will help your coalition function efficiently and effectively. Coalitions can be structured in a variety of ways, including non-profit organizations, loosely organized partnerships without formal bylaws or formal entities with a board of directors. Coalitions can choose to form committees or work groups to perform most tasks or the coalition as a whole can work on all of the issues. Each coalition must select the framework for organization that will secure the most buy-in from members and allow the organization to operate effectively. Programs that include youth membership and participation will find a source of real energy and commitment. Experience suggests youth learn best from peers. Their involvement could be key to the success or failure of an effort. Following are some suggestions from Youth on Board, a national program that seeks to place young people on boards of directors, on how and why to involve young people in the coalition. Know why you want to involve young people. Organizations need to check their motivation and be ready to see young people as partners in decision-making. Make sure the board or other coalition members are committed to giving youth a voice in the planning and implementation of the organizations strategic plan. Train the coalition/board on intergenerational relationships and diversity issues. It is important to commit one board meeting to some type of training. Make sure adult board members understand the value of a young persons views and input, particularly on issues that affect their age group. Conduct a thoughtful and thorough recruitment process. Insure that the young people understand the expectations of participation and make it clear that the choice is a mutual one. Be sure to have an interview process and a signed letter of agreement. Be thorough in orienting the young person on the organizations/coalitions structure and polices. Assessing the contributions of these new members will give an idea of their skills and help them feel more involved. Institutionalize the young peoples membership by amending bylaws and policies to state young people will be permanently included on the board. Insure that when one young persons term of office has ended, a rapid and thoughtful replacement process ensues. Add interactive structures to board/coalition meetings to insure that everyone has a voice. Youth members often need time to prepare for the meeting and to evaluate and discuss it afterwards. Other members of the coalition or staff should meet with the young people before the meeting and after the meeting for a few minutes. This can be done as a formal or informal mentoring program. Each month, the young people should have contact with staff or coalition/board leadership to maintain communication and to insure young people are included in the informal conversations and business, which takes place between meetings. Young people should have visible leadership positions such as chairing of committees. Set up systems and situations for young people to build teams with one another. Be thoughtful about the special considerations and support that are necessary when involving young people. For example, they may need rides to meetings, and so forth. If meetings usually take place during the day, plan to adjust schedules to fit around school schedules. Success is the best way to keep people involved in a coalition. Everybody loves a winner. Each coalition achievement may not be big or flashy, but each one should be noted and celebrated. In fact, small victories, in which members of the coalition actively participate, keep people motivated and willing to carry on the campaign that ultimately wins the war. Following is a list of ways to maintain an effective coalition. Celebrate victories. Host a small party or reception or awards ceremony to recognize individuals who played key roles in the coalitions successes. Recognition will go a long way, particularly when times get tough and the successes harder to achieve. Demonstrate what people can do and whats in it for them. An underage drinking prevention coalition reaffirms what people in prevention are doing and re-energizes them if their efforts have gotten stale. The public health emphasis of underage drinking programs may appeal to health care professionals such as hospitals, doctors, nurses, and emergency medical technicians. For law enforcement, the coalition can produce decreased alcohol-related motor vehicle crashes, deaths, injuries and crimes. For businesses, it can improve the productivity of future workers and current workers whose underage children may be in trouble, thereby diverting the employees attention away from their jobs. Participation also offers some good public relations potential by demonstrating that they are good corporate citizens and concerned about their communities. For auto and health insurance companies, it can reduce alcohol-related diseases, trauma and expenses. For substance abuse treatment professionals, it can reaffirm the value of intervention and treatment, improve mechanisms for identifying and referring individuals who need treatment and build support for treatment efforts. Determine the purpose and type. (Problem solving, decision making, reporting and presenting information, planning, reacting and evaluating, or a combination. Establish objectives and develop an agenda. Provide participants with a copy of the agenda, materials and any instructions. Confirm meeting room logistics (room set up, equipment). Establish a schedule and location of regular meetings early in the year so members know where and when they should gather well in advance and can plan their schedules appropriately. Begin and end the meeting on time (most meetings should be one to two hours, unless otherwise specified). Recognize new issues as they arise and agree on how to deal with them. Encourage participation of all members. Intervene when discussions go off point or are redundant. Summarize each agenda item as it is completed to insure understanding and consensus. Establish and assign action items. Determine whether a following meeting is needed, and if so set a tentative time, date and agenda. Prepare and distribute minutes or meeting summary. Act on or implement the decisions of the meeting. Plan any follow-up meetings or other activities. Every group or organization faces obstacles. Following are some suggestions for ways of dealing with problems common to coalitions. 1. Manage resources effectively to avoid having the coordinator do all the work. The person or people who establish the group (usually the project coordinator) become, in essence, the coalitions staff. The members of the coalition, however, may not realize these staff people have other duties and responsibilities. Do not fall into the trap of having the project coordinator do all the work. The best way to overcome this obstacle is to involve members of the coalition in the organizations projects and activities. Assign a program or activity to a coalition member and ask that individual to recruit others to assist. Organize committees and give full responsibility for managing those committees to the chair. Allow coalition members to report on their activities at each meeting. The project coordinator may also want to develop a job description and discuss it with members of the coalition to make sure everyone understands roles and responsibilities. A coalition organizer should not expect that everything assigned to the coalition members will automatically be accomplished. Most grassroots coalition members are busy people. They usually have jobs of their own. Many have families. In other words, the coalition may not be their top priority. If coalition members are requested to do something, follow up insures the task is completed or assistance is provided. 2. Allow time for buy-in to insure the group maintains interest and stays involved. The coalition leaders task is to insure a delicate balance and make sure members feel a strong sense of participation. Allow sufficient time for all business, but make certain that the process does not become interminable and turn people off. The organizer or staff person(s) may not like the pace the group has adopted and may want to move ahead more quickly. One of the basics of successful coalition building, however, is obtaining the members buy-in and support for the group and its activities. If you ask an individual to donate time and share opinions, that individual must have some time to express those views. Reaching consensus is not always an easy process. A successful coalition operates as a democracy, not a dictatorship, although the staff person(s) organizing the group may wish to make some kingly declarations from time to time. It is important to recognize that developing ideas and solutions can take more time than anticipated. 3. Choose a strong leader to maintain focus. It is essential for the group to choose a leader or chairperson to represent them. A strong leader will keep the coalition on task and moving forward, despite the human tendency to digress from an agenda, particularly if that agenda is difficult. The chairperson does not necessarily have to be well known in the community, but that may help. Sometimes, a coalition may lack a strong leader and lose focus. If this happens, the project coordinator should identify two or three members of the coalition who are well respected by the other members. The coalition leader should enlist their support in identifying ways to reestablish focus. In the case of underage drinking or drinking and driving, inviting a victim to come speak to the coalition will remind everyone why they are involved and how important the issue of underage drinking is to them and to the community. 4. Provide training for contact with the media. Dealing with the media can be difficult. Many people do not know how to talk to reporters and convey a story effectively. The coalition leaders task is to identify one or two coalition members who could serve as good spokespeople. These are usually people who understand the issue and are animated, but controlled, when they talk. Training and practice can refine their presentation skills and their ability to convey the coalitions message clearly and succinctly. (See the Community How To Guide on Media Relations in this series.) If your coalition includes a member of the media or a person from a local public relations agency, ask that member to provide some tips on effective media presentations. 6. Keep moving forward despite the unwillingness of key groups to become involved. Sometimes a new coalition or project may encounter a likely partner who refuses to participate. Following are suggestions on how to deal with this situation and not get stymied by their refusal. Reach out to one or two members of the group in question through a personal meeting, and explain the intent of the coalition. Determine what aspects of the issue or program interested them to join the new coalition. Solicit their input for activities or areas or interest for a successful outcome. Establish a subcommittee to evaluate long-term application of their ideas. Cherilynn Uden, project coordinator of Save Our Youth, faced this situation in Salt Lake City, Utah. Adults from the school system felt they were already doing enough on underage drinking and did not need another group. Our attempts to explain that our goal was to bring people together were not successful. So, we went directly to the young people through a non-profit organization that formed peer leadership teams in nearly every high school in the city, she said. If your attempts to involve the partner are not successful, do not stop your efforts. Keep working to make the project successful because nothing sells like success. When other groups see you are making progress, chances are they will want to join, particularly after the effort has been made to win their support. Helping key groups understand how the coalition can benefit them is powerful strategy for recruiting and retaining members. Broad-based coalitions can provide critical support for activities important to their member organizations. Following are just a few examples of the ways that coalitions can work effectively to support efforts critical to the success of an underage drinking prevention effort. Building political and community support for strong enforcement policies and activities. If members of the local government or the community fail to see the value of enforcing the laws related to underage drinking, the coalition can work for increased support of the effort by publicizing the extent of the underage drinking problem and the relationship between enforcement and prevention. In some cases, it is difficult for law enforcement agencies to obtain adequate money and equipment to perform expanded underage drinking enforcement activities. Coalition members can advocate increased funding and can sometimes obtain donated equipment or funds to support the effort more rapidly than the law enforcement agencies can. In Montgomery County, Maryland, police officers from an alcohol enforcement unit told members of the Drawing the Line coalition that it was difficult for them to call the parents of all the young people they found at large parties because they did not have access to adequate phones. One of the coalition members had a friend who was the public relations representative for a phone company. As a result, the company donated six cell phones and reduced-price airtime for the alcohol enforcement unit. Advocating swift, consistent consequences for offenders through the courts and juvenile justice system. Law enforcement officers sometimes report that they do not cite or arrest underage drinkers or people who provide them with alcohol because nothing really happens to the offenders. Coalitions can help to break this cycle by working with courts, juvenile justice authorities, motor vehicle administration authorities and liquor licensing agencies to insure that penalties for adults and youth who violate the law are swift and consistent. Coalitions can collect data on the disposition of citations and arrests, sponsor court watch programs, write to officials with the authority to make changes in the systems and publicize the need for consistent consequences. If penalties are imposed, officers will feel more motivated to play their important role in prevention through strict enforcement. Working for changes in state and local laws, policies and procedures. Insuring prevention programs are research-based and reinforce the no-use message. Targeting resources by collecting and analyzing data from a variety of sources. With their diverse memberships, coalitions are well equipped to collect data from a variety of sources, analyze the data and to craft a strategic plan based on the information. This kind of careful needs assessment and strategic planning can help law enforcement agencies direct their resources and programs effectively and track the results of their programs. The coalition can also help the law enforcement agency to develop an efficient system for tracking underage drinking-related data within their department, through a computer program or other reporting system. Reducing recidivism by insuring that adequate resources for assessment and treatment are available. Law enforcement officers do not want to keep arresting or citing the same youth over and over, but they may not be able to guarantee that assessment and referrals to treatment are readily available in the community, whether or not young people have health insurance. A broad-based coalition can work with public and private agencies to insure that assessment and treatment are part of the community system for dealing with underage drinking offenses. In Montgomery County, MD, for instance, Drawing the Line on Underage Alcohol Use arranged for each young person who is cited for an underage drinking offense to be assessed for alcohol and mental health problems. If young people were identified as having a problem, they were referred for appropriate treatment. Convincing key members of the community that underage drinking prevention is a community responsibility and not solely the responsibility of the schools. Coalitions can enlist the community in prevention and help key segments, including parents, understand the critical role they must play in preventing underage drinking. Advocating for adequate funding and staff to enable schools to conduct prevention and intervention programs. The coalition and its members can initiate and support budget requests and make a convincing case for the importance of the funding. The coalition members can help to identify the most effective school-based programs, work with officials responsible for allocating funds and publicize the need for specific projects. Providing volunteers to support school-based programs for youth. Recruiting, training and managing volunteers to augment the school staff and provide valuable alcohol-free activities for youth and educational and motivational programs for parents. Schools are sometimes constrained from sponsoring activities like dances, mentoring programs or other after-school programs because they cannot afford to pay enough teachers and other staff to supervise them. Insuring that schools have a clear, carefully communicated policy about underage drinking and that the policy is consistently enforced. If schools do not have specific policies regarding the consequences for underage drinking on and off campus, a coalition can urge the school system to develop one and then assist in its formulation and distribution. It is important that parents, students and school staff are fully aware of the policy if it is to be effective. If a school system has a policy in place, a coalition can work to see that the policy is consistently enforced. In some schools, athletes or other student leaders are granted leniency when they commit an offense, but other students receive the full brunt of the consequences. This kind of inconsistency sends seriously mixed messages. Coalitions can work for consistent application of consequences by monitoring how the schools apply their policies and by building public support for the schools actions. In some communities, when the schools penalize an athlete or other student for underage drinking, parents and other community members complain because they may not understand the importance of intervention and prevention. The coalition can work to overcome that resistance and build obvious public support for the effort. Assist schools in developing effective systems for identifying students in trouble with alcohol and/or other drugs and for referring them to treatment. Students using alcohol and other drugs may not only need discipline, they may need treatment. School systems should develop student assistance or student identification programs to identify those youngsters who may need help and assist them in obtaining whatever assistance they need. If students are re-entering school after being treated in a residential facility, the school system should also be prepared to assist in identifying after-care services for those youth. Coalitions, which include prevention, treatment and law enforcement specialists, can help the schools to promulgate policies and develop programs that will serve youth in need. One strategy for increasing buy-in among coalition members is to devote part of a coalition meeting to brainstorming ways in which the coalition and its members could support other constituent groups. How could a coalition support the judiciary, for instance? Or the medical community? Enumerating the potential benefits for each segment of the coalition can help them to see the value of their participation. Marketing is the process whereby an organization sells their product or ideas to the public. Marketing of an underage drinking prevention coalition is important in order for the target audience and the general public to accept the actions, plans and ideas the coalition has proposed. It is a necessary component in changing behavior and attitude. When we turn on the television set, we see dozens of advertisements designed to motivate us to buy particular products, vote for certain candidates, see particular movies or take some other action. Each of the businesses or organizations sponsoring these advertisements has one fundamental goal in mind: to influence their target audiences attitudes and behavior by marketing their product or idea to them. Need to increase membership, raise money, change laws, involve parents, etc. Who can help to solve the problem? Become a member, provide money, draft a new law, etc. What does that person or organization currently know or believe about underage drinking and our coalition? Do they view underage drinking as a rite of passage? A moral issue? A problem for the schools to solve? Do they see the coalition as just another group of do-gooders? What do you want the person or individual to believe so that they will provide what you need? In other words, what do you want them to think and feel -- remember that feelings are important in an issue as complex as underage drinking -- so that the coalition can achieve its goal? What are the key characteristics of the individual or group you need to reach? Are they wealthy or poor? Are they highly educated or semi-literate? Members of a minority group? Is English their primary language? How old are they? Are they part of a government agency with established policies that may take some time to change or can their group make decisions quickly? Is the individual or group difficult to reach through individual contact? How can you reach these individuals or organizations? Through media, personal contact, networking with other groups, introduction by an individual who has contact with the coalition and the target group or individual. Who can influence the targeted individual or group? Commercial marketers often target their messages to the influencers when they want to shape someone elses behavior. Cereal and toy companies, for instance, advertise heavily on cartoon shows and other programs for children so that they can create demand for their products among children who, in turn, influence their parents shopping decisions. Coalitions can learn from these advertisers and reach out to individuals or groups who have influence with others. Can the coalitions champion affect the targets behavior, i.e., a local elected official putting pressure on a law enforcement agency? Or will the local PTA influence schools? Chambers of Commerce may influence their members or members may change the Chambers perspective. Popular youth and parents may influence behavior by others in their groups. The media can influence large numbers of diverse groups. Based on the answers to the preceding questions about the target audiences characteristics, what they believe now, what you want them to believe and how you can reach them, craft your message to be as effective as possible. What will it cost you to market your message to this individual or group? Costs should be measured not only in money, but also in time, energy, material and influence. Is the benefit that will accrue to the organization worth the expenditure necessary to obtain it? These questions can help you to prioritize your efforts. How will you know if your message has been received and accepted? What is your fall-back approach if reaching out to the targeted individual or group does not achieve the goal? If you cannot motivate or mobilize the target, what else can be done or who else can be approached? Ask the same series of questions about the target audience to develop the strategy. Communication from the projects organizers to the coalition is critical, particularly if the coalition only meets on a quarterly basis. These updates do not have to be complicated or difficult. If the task of producing the update is too cumbersome, it probably will not be produced because other tasks will take priority. Keep it simple and effective. At each meeting of the coalition, a person should be designated to take notes so that a report can be compiled and mailed to all the members of the coalition. This keeps every member informed and reminds him or her of what actions have been taken or proposed. One of the ways that Gloria Souhami of Texas regularly updates members of the Travis County Underage Drinking Prevention Coalition is to send them news clippings that mention underage drinking. These informative, timely updates are among the reasons, she says, that so many people attend the coalition meetings. She also invites interesting and informative speakers to each coalition meeting. A brochure about the organization and its mission, goals and objectives is a good way to educate people. Part of the brochure also can ask people to join or financially support the effort. 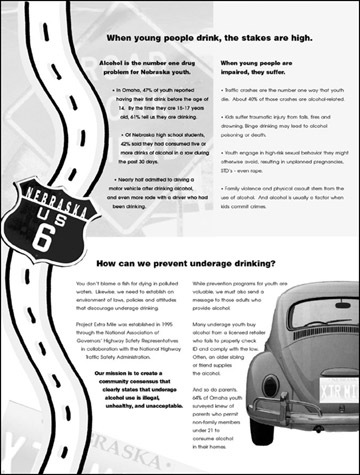 A brochure can also be used to highlight a portion of your program, such as educating parents about their role in preventing illegal underage drinking. An effective newsletter or brochure does not have to be an elaborate, four-page publication with color photos and graphs and charts. A newsletter can be one sheet of paper, printed front and back as a self-mailer that can be folded and mailed. Every publication should be interesting to look at and include graphics, bulleted information and, if possible, photos. Most computer systems have some sort of graphics package with symbols that can be easily inserted into a document. If a graphics package is not available, the project organizer can keep a file and clip out interesting graphics from newspapers, magazines and other newsletters. They can be pasted directly onto the projects newsletter and will appear to be part of that document when it is printed. Appendix #s 4, 5 and 6 are samples of a Brochure and two Coalition Newsletters. Participate in determining the direction of the coalition. Serve as the liaison to the members organization. Organizations represented should have an impaired driving policy and conduct employee awareness and education. Participate in the completion of a comprehensive needs assessment on the communitys underage drinking problem. Assist in drafting a strategic plan on underage drinking and in prioritizing goals and objectives. Assist in the implementation of activities, including those that directly involve or relate to the members organization. Serve as a resource for the development of program activities. Help to represent the coalition at key official meetings and events. Serve as an ambassador for the work of the coalition and promote its mission when and wherever possible. Gather and relay appropriate information to the coalition to serve as a basis for decisions. Help to develop and implement a self-sufficiency plan. Hiring a coordinator is one of the most important decisions a coalition can make. Following are some valuable attributes for good coordinators. Does the candidate your coalition is considering or the individual who currently serves as project coordinator possess a majority of the following traits? Has an ability to say and do things that give others a feeling they are playing an important part in whatever is being done. Communicates clearly the results that are expected. Appeals to peoples hearts and minds. Demonstrates care for the members of the group. Demonstrates confidence in their abilities. Lets people know how they are progressing toward the groups goals. Promoting the development of peoples talents. Enabling others to feel and act like leaders. Knows the latest information, statistics, trends, and programs related to the problem they are trying to solve. This is particularly important for coordinators who are unfamiliar with underage drinking or traffic safety issues. 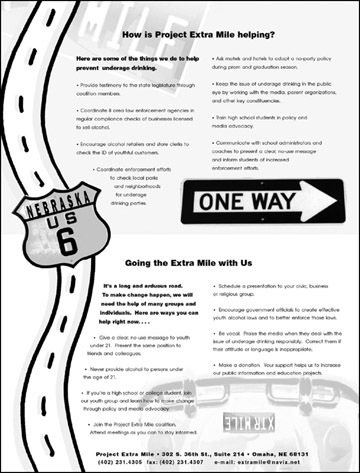 Coordinators of coalitions who come from the health care community or substance abuse prevention field should contact their state National Association of Governors Highway Safety Representatives (NAGHSR) representative and request they be placed on relevant mailing lists for information, particularly any mailings generated by the National Highway Traffic Safety Administration (NHTSA). Has a vision for the organization and where they want it to be in the future. Is committed and enthusiastic about what they are doing. They do not readily surrender to difficulties, but overcome them. Their commitment is catching and will entice others to join the bandwagon. Has courage, self-confidence, and decisiveness. Has persistence and patience and will push ahead, particularly when things bog down. Knows themselves, their strengths and weaknesses and works hard to enhance their best qualities and minimize the impact of any weaknesses. Originates ideas and does not hesitate to make decisions when appropriate. Stands up for what is important, adjusts plans and actions as necessary, communicates the strategy of the organization as a whole and creates a positive vision of the future. Assumes responsibility, particularly when things dont go according to plan. The buck stops here is a phrase that not only applies to leaders of countries, but leaders of organizations. Speaks and writes simply, clearly and persuasively. Can sum up the opinions of groups of people, and express them sharply and decisively. Communicates regularly with the group, making sure people know important meeting and due dates well in advance. Communicates expectations and decisions clearly. They are not vague, nor do they try to get results through manipulation or autocratic rule. Is thorough, and tries to put things in writing to avoid the pitfalls of forgetfulness, particularly when dealing with many people and a variety of projects and activities. Always tries to be fair and avoid interjecting personal likes and dislikes or prejudices. Able to organize meetings, send out notices, track the progress of tasks, and manage the budget. CADCA is a national organization of coali-tions dedicated to substance abuse preven-tion. CADCA offers training and resource materials, including a series of Strategizers for coalitions. The National Association for Community Leadership is a non-profit organization, founded in 1979, dedicated to nurturing leadership in communities throughout the United States and internationally. Their mission is to strengthen and transform communities by enhancing the capacity of inclusive, community leadership development efforts. The Safe Communities Service Center is designed to be an informational resource and technical assistance enterprise to advance Safe Communities nationwide.The Center monitors and tracks activities being conducted by the U.S. Department of Transportation and the National Highway Traffic Safety Administration (NHTSA), as well as other federal, state and local partners. The Center also catalogs information, resources and materials to community coalitions directly to providers who can service their specific needs. The Center is continually identifying a national network of Safe Community practitioners, marketing best practices, facilitating new partnerships, promoting citizen involvement, evaluating campaign progress, and initiating a number of other handy and helpful ways to build Safe Communities. The Support Center/NDC is a consulting and training organization, which conducts workshops, publications, and special management programs. The Center assists non-profits in utilizing the best management tools and concepts to help them best serve their communities. Topics include defining purposes and goals, adhering to missions, obtaining and retaining high quality volunteers and staff, creating comprehensive financing plans, responding to change by adjusting services and opera-tions, evaluating services to assess effectiveness, and communicating goals both internally and externally. 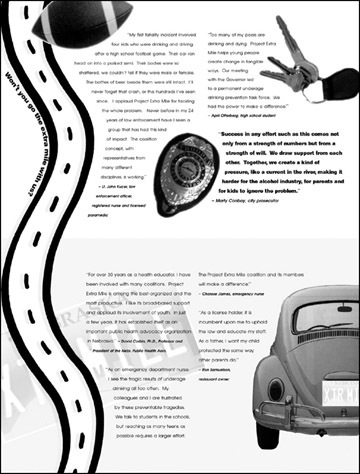 This publication is designed to help traffic safety professionals form injury prevention partnerships. It encourages collaboration between traffic safety and public health communities, and suggests program ideas for the federal, regional, state and local levels. Nine extensive appendices include prevention objectives, state highway offices, passenger laws, reading suggestions and a glossary. This book, aimed at people in their 20s, recounts the personal experiences of fledging activists and includes a chapter on how to procure grants for grassroots groups. It offers a step-by-step guide to starting an organization which works for social change, covering meetings, budgets, demonstrations, lobbying and using the press and the Internet. This book shows how to create, maintain and judge an organizations budget and how to make sure it conforms to guidelines recommended by the Financial Accounting Standards Board. It includes a disk to be used with Lotus 1-2-3 to develop model spread-sheet programs. This booklet analyzes the characteristics of effective boards and suggests ways for every board to improve its performance. This publication helps boards assess the strengths and weaknesses of their members, identify and cultivate prospective trustees, and recruit and involve qualified and committed new members. It includes sample recruitment forms, letters and checklists. Documents are on disk in Microsoft Word (for Windows), WordPerfect (for DOS), and as generic text files. The newsletter includes stories about successful prevention efforts around the country and resources for coalitions. This critical primer for board members covers the most fundamental responsibilities of non-profit boards. Includes an orientation for new board members, a refresher course for more experienced leaders, preparation for a planning or self-assessment retreat, a recruiting tool to share with prospective board members, and a referencve for chief executives and other staff. This guide to effective participation provides both active and prospective board members with guidance and basic nuts-and-bolts infor-mation about board membership. It also answers the most common questions and concerns of prospective board members, outlines the key areas of responsibility, and details the rights, obligations and liabilities of nonprofit board members.